Did a website, co-worker or friend mention the book “The Pragmatic Programmer”? The same thing happened to me. I wish this book had been available when I wanted the essential teachings of The Pragmatic Programmer. This book is your time-saving summary of “The Pragmatic Programmer: From Journeyman to Master” by Andrew Hunt and Dave Thomas. You can consume this summary guide in one sitting. This is the book I wanted. This summary is all the things you need to know in a compact, easy to read, low-risk format. 1) Developers, engineers, and managers who need the Pragmatic Programmer principles summarized. 2) Developers, engineers, and managers who need a refresher on the lessons from The Pragmatic Programmer. 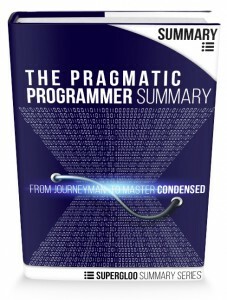 Compact summary of the principles of The Pragmatic Programmer: From Journeyman to Master in a fast, convenient format. Saves your time from re-reading the 350+ page book to re-absorb, remember and categorize concepts. Everything has been organized for you.